We've discussed in the past that when we watch a biography, we would like to feel that we've learned something. If we're watching a movie about something that we've never heard of, one would assume that we would come away having learned many things. (Of course, we wouldn't know how accurate it was, but that's outside the scope of this conversation.) These movies can be engaging or easily forgettable, depending how interesting and relatable the subject is. However, if a biography focuses on someone with which we are familiar, that is a different story. We go in armed with some knowledge and we hope to learn a lot more. I, of course, am very familiar with the music of The Beach Boys, and I'd heard various stories about Brian Wilson, but I was hungry to learn more, so I approached Love & Mercy with great expectations. Love & Mercy explores the life of Brian Wilson during two different periods of his life. We start in the mid-1960s when The Beach Boys are at the height of their popularity. However, following a panic attack, Brian (Paul Dano), announces that he will no longer be touring with his brothers, Carl (Brett Davern) and Dennis (Kenny Wormald), and Mike Love (Jake Abel). While the rest of The Beach Boys go to Japan to tour, Brian stays in Los Angeles, where he begins to obsessively compose the songs for the Pet Sounds album. However, he begins to have auditory hallucinations and his insistence on perfection wears on those around him. The other part of the story takes places in the 1980s, where a very subdued Brian (John Cusack) is under the care of Dr. Eugene Landy (Paul Giamatti), who lords over Brian and rarely lets him out of his sight. While car shopping, Brian meets Melinda Ledbetter (Elizabeth Banks) and is immediately smitten with her. Melinda is interested in pursuing a relationship with Brian, but she can't get over the weird Svengali-like relationship between Brian and Landy. Director Bill Pohlad and Co-Writer Oren Moverman have taken a very interesting approach to the material in Love & Mercy. In theory, the story of Brian Wilson’s life could have encompassed several movies, as his life has contained several distinct chapters. Instead, the makers of Love & Mercy have decided to focus on two very distinct, and decidedly very important, parts of Brian’s life. Again, the story opens around 1965 when The Beach Boys have already had several hit records and are well-known. The film assumes that we are aware of the group and their popularity and places its emphasis on the period when Brian was away from the rest of the group, not only working, but beginning his descent into mental illness. The other part of the story examines a period in Brian’s life where he had little control, over himself or his life. Often overly-medicated, Brian seemed detached from reality and he’s reached a point where he let’s Landy make all of his decisions. Gone is the brilliant musician, replaced instead with a ghost. I don’t know enough about Wilson’s story to call Love & Mercy a “tell all”, but it certainly doesn’t seem to pull any punches. In the 1960s, Brian is portrayed as someone who was a creative genius, but also very difficult to work with at times, as the session musicians couldn’t keep up with his ever-changing ideas. The movie also doesn’t shy away from his drug use (although, it doesn’t dwell on it either). In the later years, we see Brian as someone to be pitied at times, as he clearly isn’t in touch with reality, but also someone who has regressed to childlike behaviors. The movie doesn’t hesitate to portray Landy as a leech who enjoys controlling Brian, and presumably enjoys the money. We see how the other members of The Beach Boys, especially Mike Love, doubted Pet Sounds and Brian’s father (Bill Camp) is portrayed as a bitter, abusive man. The narrative approach in the film is certainly interesting, but it’s also a flaw. The movie cuts back and forth between the two time periods, and thematically, this works well, as we watch the decline of one Brian and the re-emergence of another. The problem is that the 1960s scenes are far more interesting and when the movie focused on 1980s Brian, I found that I wanted it to go back to the other story. The scenes with the younger Brian show a mad-genius at work and they are filled with manic energy. Once Brian is older, the movie slows to match his pace and it becomes somewhat dull. John Cusack (who really needs to go back to comedy) is fine in his role, but this sluggish Brian simply isn’t an interesting character. Speaking of the acting, it is top-notch here, with Dano slipping very easily into the role of Brian, while Elizabeth Banks shines in a rare dramatic role for her. 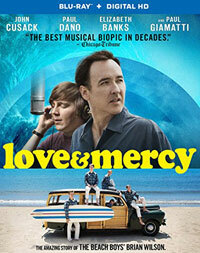 Obviously, Love & Mercy will appeal to fans of The Beach Boys, although they may not like some of the dark places which the film goes. Everyone else will find a very intriguing character study which looks at how genius can be misunderstood and then how mental illness can be misunderstood as well. As one would hope, the movie features plenty of great music and this only helps to compliment a film which isn’t perfect, but definitely takes us inside one of America’s musical dynasties. Love & Mercy gets around on Blu-ray Disc courtesy of Lionsgate. The film has been letterboxed at 1.78:1 and the Disc contains an AVC 1080p HD transfer which runs at an average of 30 Mbps. The image is very sharp and clear, showing no notable grain and no defects from the source materials. The colors look very good, and the movie features many bright tones. The image is never overly dark or bright. The level of detail is impressive, as the picture is rarely soft. We also get nice depth in many shots. The Disc carries a DTS-HD Master Audio 5.1 track which runs at 48 kHz and an average of 4.0 Mbps. The track provides clear dialogue and sounds effects. First of all, the music sounds great. It fills the speakers and we really get a sense of the layers involved in Wilson’s compositions. The stereo and surround effects are good, as they show good separation and detail. The Love & Mercy Blu-ray Disc contains only a small amount of extra features. We begin with an AUDIO COMMENTARY Director/Producer Bill Pohlad and Executive Producer/Co-Writer Oren Moverman. "A California Story: Creating the Look of Love & Mercy" (11 minutes) has Production Designer Keith Cunningham and Pohlad discussing the challenge of shooting various eras and attempting to re-create real locations. This contains some on-set footage. "A-Side/B-Side: Portraying the Life of Brian Wilson" (26 minutes) is a making-of featurette which focus on the story. Pohlad, Moverman, and others talk about how they approached relaying the life of a man who changed so much over time. This contains interviews with Brian Wilson & Melinda Wilson, as well as archive footage and stills of Wilson at work. This shows how everyone collaborated to tell this story. The Disc contains four DELETED SCENES which run about 7 minutes. The first two scenes here should have been kept in the film, especially the second one, as it fills in a fairly big gap.